A horse is the projection of peoples’ dreams about themselves–strong, powerful, beautiful–and it has the capability of giving us escape from our mundane existence. The best gold horse jewelry is a union of sorts, bringing together the finest gold, gemstones and diamonds with an artist’s gifted vision and magnificent equine subject material. You get it all: the sparkle, the shine, the beauty, the passion. This is the type of jewelry that takes people’s breath away – the gift of a lifetime, a piece of fine horse jewelry that will be treasured for generations. Consider this 14K Gold Majestic Stallion Head Pin. The eye is a ruby, the bit, a brilliant blue sapphire. There’s .12 cwt of diamonds in the bridle, and the gold itself is beautifully worked and detailed: check out the dynamic, flowing mane and the finely wrought ears. We have a lot of fabulous horse pins in the Show Stable Artisans collection, but this gold horse pin is one of the best. We love the energy of this pin, and its size: at 1 3/4″ by 1 3/4″, this gold horse pin gets noticed. You’ll love the admiring compliments you get when you ear this great gold horse pin. Fans of vintage horse jewelry know that there are many pieces of fine gold horse jewelry to be found. Right now, we’re loving this 14K Gold Horseshoe Pin that features a Reverse Crystal Bay Horse pin. It’s from the 1940’s-50’s, with an elegant design and timeless flare. The painting is of excellent quality, with the bay horse being shown in exquisite, realistic detail. 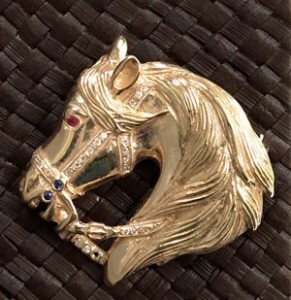 If you love vintage horse jewelry or fine gold horse pins, you’ll love this piece. Good jewelry from the 1940’s and 50’s is beginning to disappear from the marketplace. Where once these pieces were relatively common, today, we’re not seeing them as often. Make sure you get one for your horse jewelry collection. Show Stable Artisans, The Equestrian Jeweler, was started in 1994 by 2 friends who had a passion for horses and jewelry- and who wanted to share the passion with others. They sought out the best artisans who created the finest pieces of equestrian jewelry -beautiful and keepsake pieces that reflected the equestrian lifestyle. We chose the name for our blog for 2 reasons. The first reason is because we hope to “spotlight” the relevant trends, horse jewelry and information that will be of interest to you. The second reason we chose the name is to honor the most wonderful horse I have ever had- In the Spotlight, the chestnut horse pictured throughout this blog. She was an unbelievable show horse, a loving companion and my horse of a lifetime! Sterling Silver Prancing Horse Pendant. Our very popular horse pendant is a wonderful way to express passion for the horse. This graceful stylized piece is a perfect gift for the horse lover. Proudly made in the USA! Retails with the chain at $248.00. See item #HRSC0326 on our website for more details. Contest ends Sep 15, 2018. Good luck to everyone!